Star Architecture is a design-oriented architect studio where minimal contemporary design meets sustainability. It was founded in 2014. Aleksandra’s primary project types are residential and high-end residential, and her team is dedicated to developing sleek, intelligent designs that identify the architectural potential of a space – and fulfill it. Aleksandra Rakocevic moved into artDECL at the end of August, 2015. She urgently needed office space for her business due to a large project. That project is still underway, the scale of three projects in one. Aleksandra and Elisabet are excited about all their current projects. The project featured in the image is a residential build that seeks to compliment the single level culture of its suburban court by minimising the impact of their double-storey home. 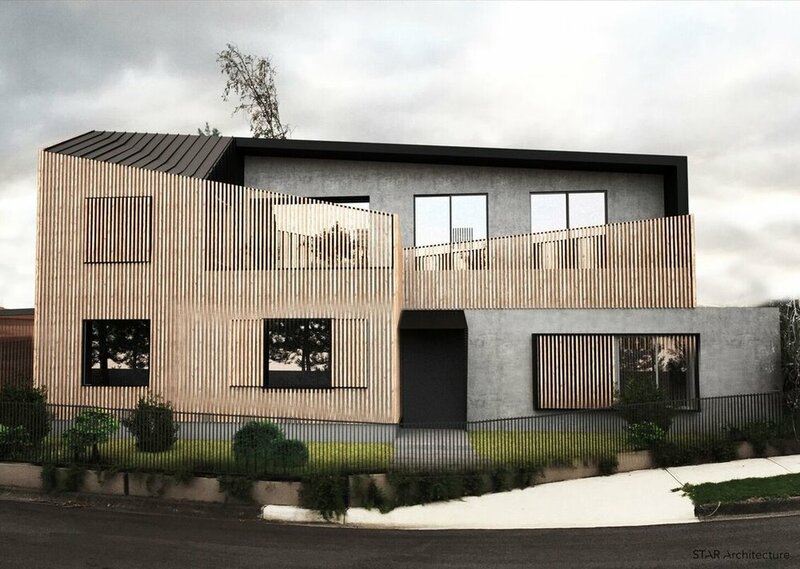 They will use timber screens to conceal solid rendered walls and downward sloping timber screens to give the illusion of the house bending towards the ground. The design also includes a garden on the first floor balcony and green side walls of ivy.